I'm sorry that English is not my native language so I'm not good at it. Here is my problem. I'm a new user on Ubuntu and I'm so excited that I can control my computer completely. 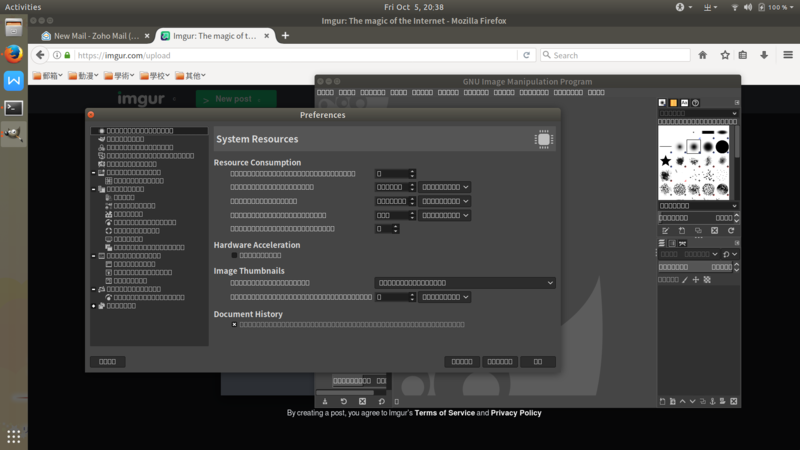 Ubuntu, as a GNU/Linux OS is so free that I can customize it. I only use English, Chinese and Japanese so that I deleted all the fonts that I don't need. I think three fonts for English/western scripts are enough so I deleted all the fonts except Freesans, Freeserif and Freemono. I think one sans serif font, one serif font and one monospace font are enough. This looks really concise. I don't need to find a font on the long drop-down menu at Office software anymore. Things go well until I installed Gimp. I launched gimp after installing it and found nearly all the characters became "tofu" (some boxes). General speaking, this only happens when lacking of fonts. However, I already have fonts for Latin scripts. I also have CJK (Chinese, Japanese and Korean) fonts with basic Latin scripts included of course. So I think Gimp use the fonts which are deleted by me, and there are something wrong with the fallback, too. I don't know which fonts do it use and I tried reinstall the fonts named "Ubuntu" to my computer (I think that "Ubuntu" font is the default font of Ubuntu, isn't it?) but nothing changed and I still got tofu. My OS version is Ubuntu 18.04.1 LTS, the gimp version is 2.10. Here are some screenshots. Thank you very much. > I'm sorry that English is not my native language so I'm not good at it. Here is my problem. > I'm a new user on Ubuntu and I'm so excited that I can control my computer completely. 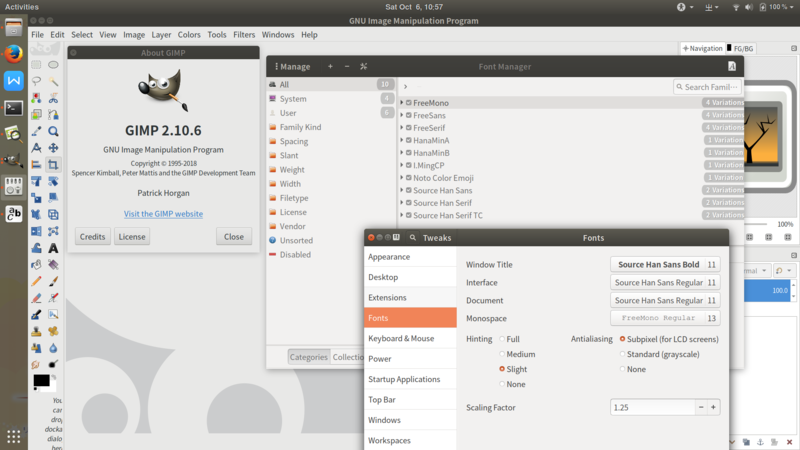 Ubuntu, as a GNU/Linux OS is so free that I can customize it. I only use English, Chinese and Japanese so that I deleted all the fonts that I don't need. I think three fonts for English/western scripts are enough so I deleted all the fonts except Freesans, Freeserif and Freemono. I think one sans serif font, one serif font and one monospace font are enough. This looks really concise. I don't need to find a font on the long drop-down menu at Office software anymore. 2. Fontconfig looks at files in /etc/fonts/conf.d/ for the rules. CJK Sans font to be used for Serif. (non-breaking spaces and similar) and DejaVu provided these. The missing text uses a Sans font, at a small size. So, I suggest that you try adding the DejaVu Sans font. > Things go well until I installed Gimp. I launched gimp after installing it and found nearly all the characters became "tofu" (some boxes). General speaking, this only happens when lacking of fonts. However, I already have fonts for Latin scripts. I also have CJK (Chinese, Japanese and Korean) fonts with basic Latin scripts included of course. So I think Gimp use the fonts which are deleted by me, and there are something wrong with the fallback, too. I don't know which fonts do it use and I tried reinstall the fonts named "Ubuntu" to my computer (I think that "Ubuntu" font is the default font of Ubuntu, isn't it?) but nothing changed and I still got tofu. > My OS version is Ubuntu 18.04.1 LTS, the gimp version is 2.10. > Here are some screenshots. Thank you very much. even the numbers, are tofu. FreeMono for monospace (sensible, FreeMono is rather small). I think that Source Han was incorporated into google's Noto fonts. also other writing systems) do not include the western characters. That should confirm which fonts are installed. - for me, this reports "WenQuanYi Zen Hei" "Regular"
in the available space ? All I can add is "Good Luck". Well grubbed , old mole! > 3. But in a default western layout, the fallback fonts are the DejaVu variants. In gnome applications, I needed to add DejaVu fonts several years ago because of odd tofu - the reason was whitespace varieties (non-breaking spaces and similar) and DejaVu provided these. The missing text uses a Sans font, at a small size. > So, I suggest that you try adding the DejaVu Sans font. Thanks for your reply. The problem was solved before I tried to reinstall DejaVu fonts. In fact, I installed Gimp from Ubuntu Software at the first time and then met the problem. Then I tried to install it by `sudo apt install gimp` and got Gimp 2.8, an old version. The characters could be displayed well on this version but I still wanted to use the latest version, gimp 2.10. Then I went to the official website of Gimp and installed Gimp by using flatpak. After installation, I surprisingly found that the problem had been solved. The screenshot shows that Gimp is using the fonts Source Han Sans, which is set as the "interface fonts" by me. And when I change the fonts for the interface, the gimp changes, too. This is what I want. Obviously the gimp I downloaded from "Ubuntu Software" didn't use Source Han Sans. Maybe that one tried using DejaVu Sans but found nothing so displayed as tofu. > Possibly, your locale is affecting this. Which locale are you using ? I'm so happy that the problem was solved. Anyway, thanks for telling me so many knowledge and commands about fonts. That also helps me a lot since I'm a newbie in Linux.